For anyone who reads, watches TV, or browses social media, it should come as no surprise that Americans, on average, are underprepared for retirement. In fact, struggling to find a way to save enough to fund a comfortable retirement is an issue that spans generations. While retirement health care cost expectations have recently stabilized, Baby Boomers facing longer life expectancies, the decline of defined benefit (pension) plans, and ongoing concerns with Social Security solvency are scrambling to save as much as possible as retirement approaches. At the other end of the spectrum, Millennials are having a hard time saving for retirement at all, often graduating from college saddled with significant debt and facing underwhelming wages. Those in between the Boomers and Millennials also have their challenges. However, the good news is that time may still be on your side. 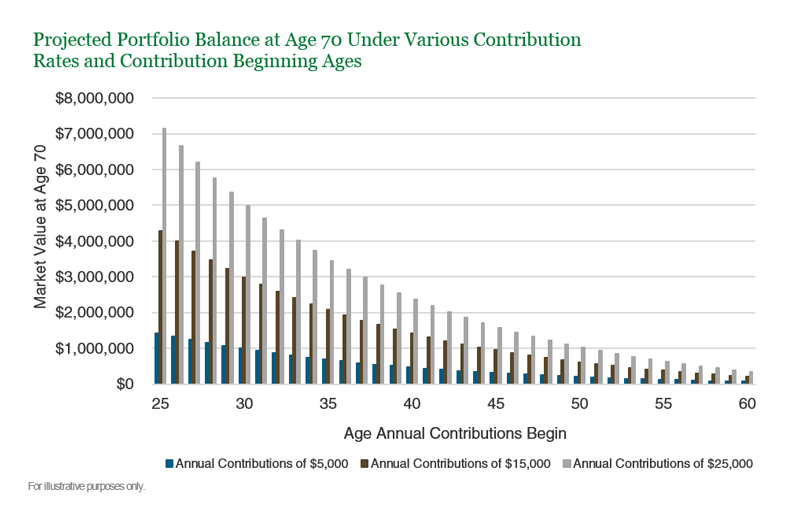 Assuming annual straight-line returns of 7%, the chart above illustrates the annual savings target necessary at different ages to achieve a portfolio balance of $1 million by age 70. This age group wishes they could have and that they would have saved more sooner. The reality is that many have prioritized paying the mortgage, raising a family, and helping with children’s college expenses ahead of saving for retirement. The good news is that, by now, some of those other expenses have (hopefully) subsided, allowing for greater focus on saving for retirement. A sixty-year old who saves $24,500 per year (the maximum employee elective deferral to 401(k)/profit sharing plan, including catch-up contributions) would accumulate nearly $340,000 by age 70 under straight-line 7% returns. Under the same example, a 50 year old who contributes the same $24,500 would accumulate $1 million by age 70. Furthermore, employer matching/profit sharing contributions, retirement contributions by a spouse, and savings to other investment accounts such as Traditional IRAs and Roths allow for the potential to boost savings significantly beyond the examples above. Time is of the essence. If the 60 year old in the example above were to delay annual savings for three years and start at age 63, they would need to boost their annual savings from $24,500 to $40,000 per year to make up for the delay. Even the 50 year old would need to save another $8,500 per year to make up for a three-year delay. Time is on your side. While there are endless demands on your money, initiating small contributions or small increases in your retirement savings can have a profound effect on your ultimate retirement balance. 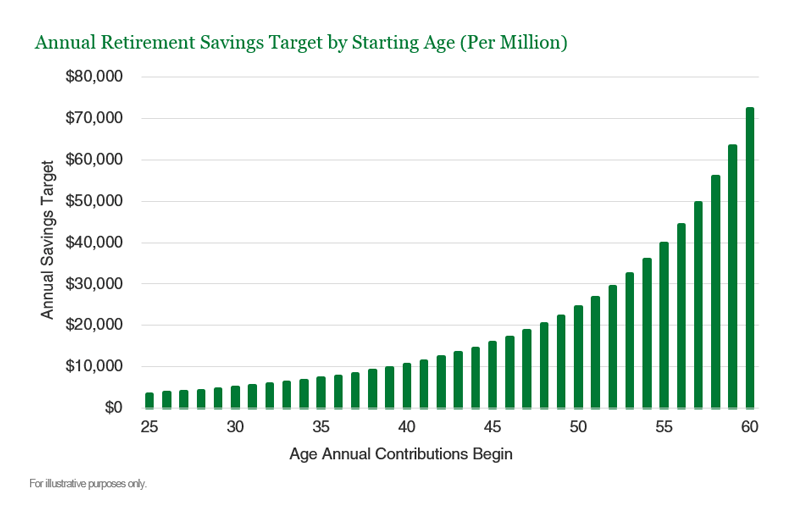 Retirement savings of just $67 per week beginning at age 25 would grow to $1 million at age 70 under a 7% straight-line return scenario and would grow to more than $1.7 million under a 9% return scenario. The impact of waiting until age 30 to make that $67 per week contribution is dramatic. While the missed $67 weekly contributions over the 5 years “only” adds up to $17,500 in total, the impact of the loss of compounding growth of those dollars is astounding. Procrastinating and failing to contribute $17,500 over five years reduces the balance at age 70 by $300,000 in the 7% scenario (i.e., from $1 million to approximately $700,000) and by more than $650,000 in the 9% return scenario (i.e., from nearly $1.85 million to less than $1.2 million). Clearly, delaying the decision to save/save more for retirement can significantly hinder your ability to accumulate wealth. Those already in their thirties or forties would need to save more to reach the million-dollar threshold. A thirty-five year old would need to save approximately $7,300 per year ($140 per week) to reach a portfolio balance of $1 million by age 70 under a 7% return scenario, while a forty-five year old would need to save approximately $15,800 per year to reach the $1 million mark by age 70. Taking advantage of employer matching/profit sharing contributions can help meaningfully lower the burden of reaching your annual savings target. The numbers above fail to consider the impact of rising wages. Increasing wages can make saving a targeted amount easier over time. In addition, contributions to an employer-sponsored retirement plan are based on a percentage of income. Therefore, as your wages increase, your retirement plan deferral automatically increases. Finally, many retirement plans include auto-escalation options that can, if you so choose, increase your deferral amount annually. Assuming annual contribution increases of 3% per year, the annual balance at age 70 would increase from $1 million to more than $1.4 million for the thirty-five year old and from $1 million to more than $1.3 million for the forty-five year old. The benefits of establishing a retirement savings plan as early as possible are profound. In addition, it is imperative to team a disciplined savings plan with appropriate tax-advantaged vehicles (e.g., 401(k), 403(b), Traditional IRA, Roth IRA, etc.) 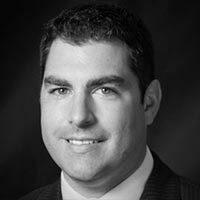 to maximize the potential growth of the portfolio over the long-term. Our experts can work with you to create a personalized and comprehensive financial plan. Learn more about the Family Wealth Management services we offer, or schedule a call with us today.